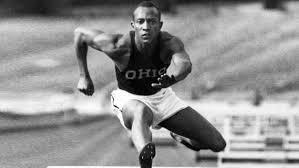 Today is the birthday (1913) of James Cleveland “Jesse” Owens (September 12, 1913 – March 31, 1980) who was a US track and field athlete and four-time Olympic gold medalist in the 1936 Games. He is often remembered as the African-American athlete who embarrassed Hitler at the Berlin Games, and you frequently see movie clips of Hitler leaving the stadium, appearing to show that he was disgusted to have his Aryan race athletes defeated by a definitively non-Aryan. This is a complete misrepresentation. In fact, Hitler shook hands with Owens and congratulated him, as Owens himself recalls (and there was purportedly a photo of them shaking hands that has since disappeared). FDR, on the other hand, refused to meet with Owens after the Games, and never congratulated him. Indeed, Owens’ life in the US after the Games was extremely hard. Owens was the youngest of ten children, three girls and seven boys, born to Henry Cleveland Owens (a sharecropper) and Mary Emma Fitzgerald in Oakville, Alabama. J.C., as he was called, was 9 years old when the family moved to Cleveland, Ohio, for better opportunities, as part of the Great Migration, when 1.5 million African Americans left the segregated South. When his new teacher asked his name (to enter in her roll book), he said “J.C.”, but because of his strong Southern accent, she thought he said “Jesse”. 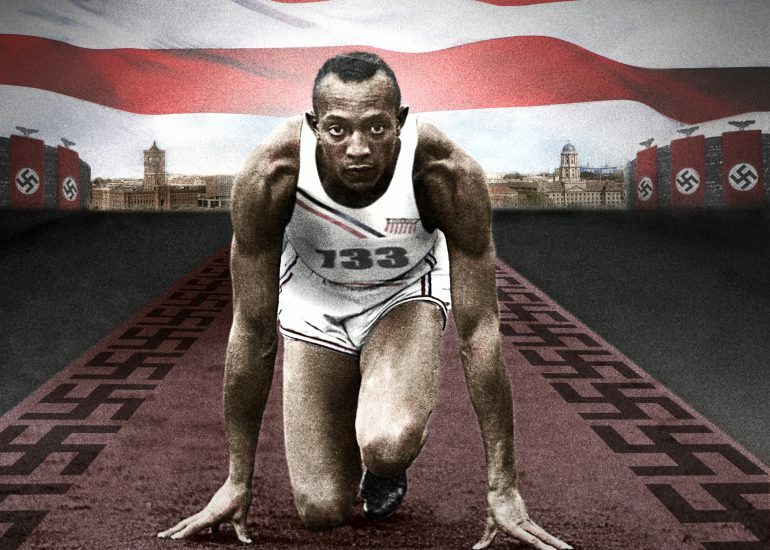 The name stuck, and he was known as Jesse Owens for the rest of his life. 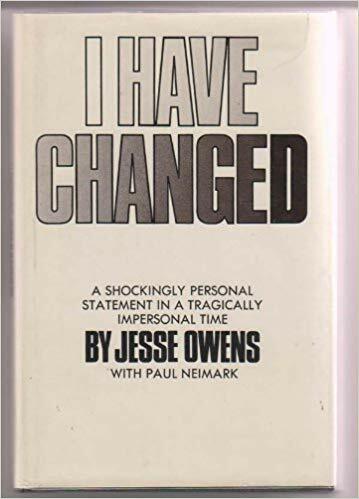 As a youth, Owens took different jobs in his spare time: he delivered groceries, loaded freight cars and worked in a shoe repair shop while his father and older brother worked at a steel mill. During this period, Owens realized that he had a passion for running. 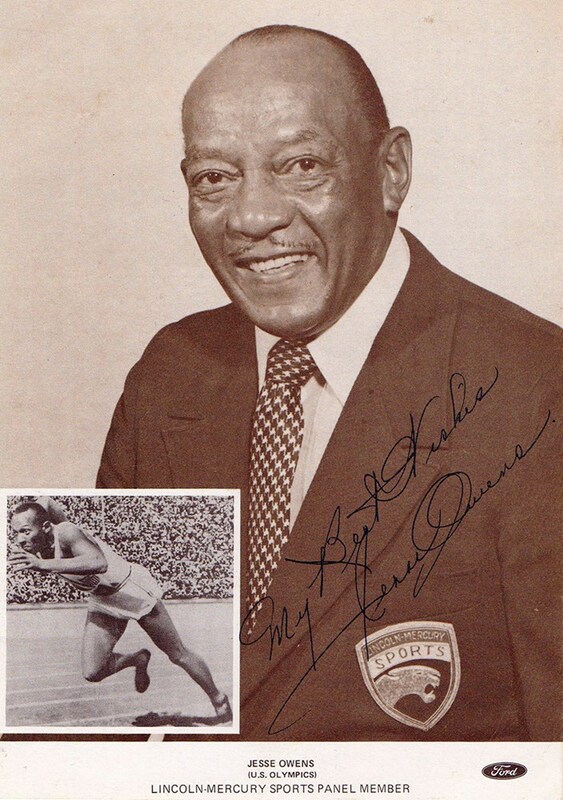 Throughout his life, Owens attributed the success of his athletic career to the encouragement of Charles Riley, his junior high school track coach at Fairmount Junior High School. Since Owens worked in a shoe repair shop after school, Riley allowed him to practice before school instead. 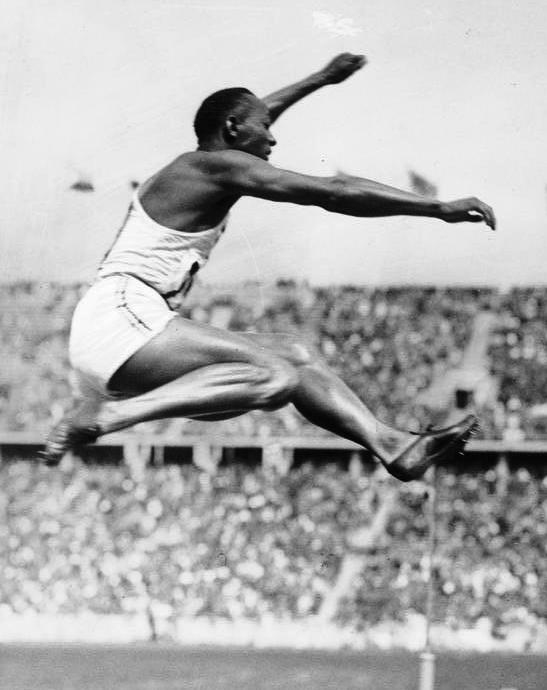 Owens first came to national attention when he was a student of East Technical High School in Cleveland; he equaled the world record of 9.4 seconds in the 100-yards (91 m) and long-jumped 24 feet 9 ½ inches (7.56 meters) at the 1933 National High School Championship in Chicago. Owens attended Ohio State University after his father found employment, which ensured that the family could be supported. Under the coaching of Larry Snyder, Owens won a record eight individual NCAA championships, four each in 1935 and 1936. (The record of four gold medals at the NCAA was equaled only by Xavier Carter in 2006, although his many titles also included relay medals.) 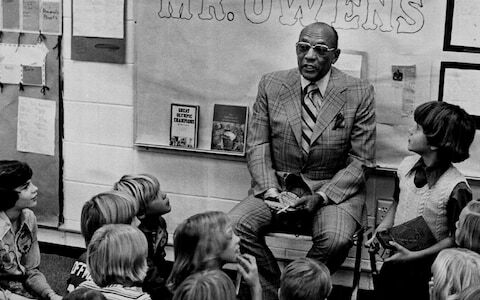 Though Owens enjoyed athletic success, he had to live off campus with other African-American athletes. When he traveled with the team, Owens was restricted to ordering carry-out or eating at “blacks-only” restaurants. Similarly, he had to stay at “blacks-only” hotels. Owens did not receive a scholarship for his efforts, so he continued to take part-time jobs to pay for school. 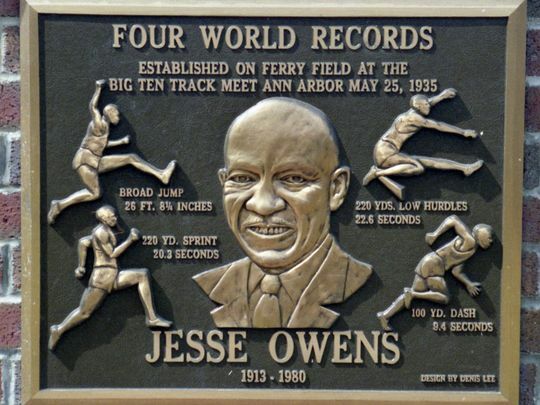 Owens achieved track and field immortality in a span of 45 minutes on May 25th, 1935, during the Big Ten meet at Ferry Field in Ann Arbor, Michigan, where he set three world records and tied a fourth. He equaled the world record for the 100-yards (9.4 seconds), and set world records in the long jump (26 ft 8 ¼ in or 8.13 m, a world record that would last for 25 years); 220 yards (20.3 seconds); and 220-yard low hurdles (22.6 seconds, becoming the first to break 23 seconds). In 1936, Owens and his United States teammates sailed on the SS Manhattan and arrived in Berlin to compete at the Summer Olympics. Owens arrived at the new Olympic stadium to a throng of fans, according to fellow American sprinter James LuValle (who won the bronze in the 400 meters), many of them young girls yelling “Wo ist Jesse? 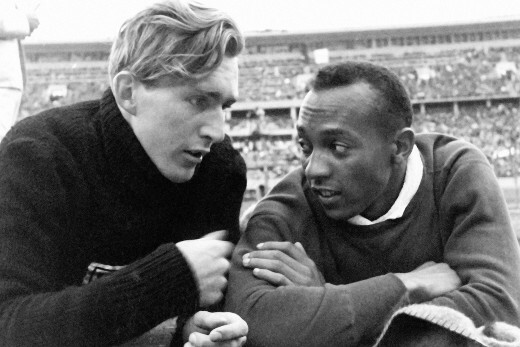 Wo ist Jesse?” Owens’ success at the games did present problems for Hitler, who was using them to show the world a resurgent Nazi Germany. He and other government officials had high hopes that German athletes would dominate the games with victories. Just before the competitions, Adi Dassler visited Owens in the Olympic village. He was the founder of the Adidas athletic shoe company, and he persuaded Owens to wear Gebrüder Dassler Schuhfabrik shoes. This was the first ever sponsorship for a male African American athlete. On August 3rd Owens won the 100 meters with a time of 10.3 s, defeating teammate and college friend Ralph Metcalfe by a tenth of a second and defeating Tinus Osendarp of the Netherlands by two tenths of a second. On August 4th, he won the long jump with a jump of 8.06 m (26 ft 5 in) (3¼ inches short of his own world record). He later credited this achievement to the technical advice that he received from Luz Long, the German competitor whom he defeated. 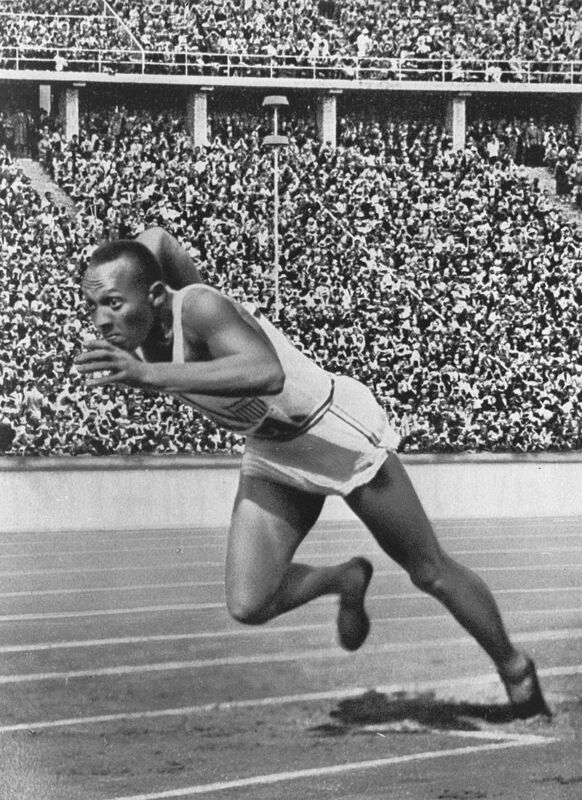 On August 5th, he won the 200 meters with a time of 20.7 s, defeating teammate Mack Robinson (the older brother of Jackie Robinson). On August 9th, he won his fourth gold medal in the 4 × 100 m sprint relay when head coach Lawson Robertson replaced Jewish-American sprinters Marty Glickman and Sam Stoller with Owens and Ralph Metcalfe, who teamed with Frank Wykoff and Foy Draper to set a world record of 39.8 s in the event. 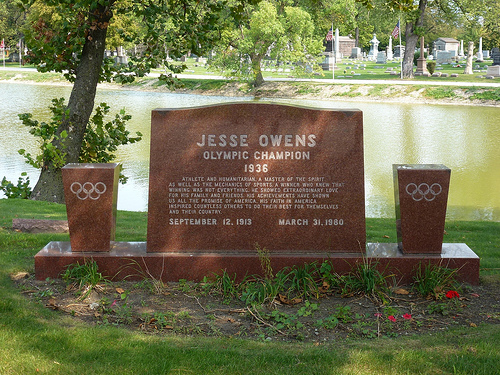 Owens’ record-breaking performance of four gold medals was not equaled until Carl Lewis won gold medals in the same events at the 1984 Summer Olympics in Los Angeles. Owens set the world record in the long jump with a jump of 8.13 m (26 ft 8 in) in 1935, the year before the Berlin Olympics, and this record stood for 25 years until it was broken in 1960 by countryman Ralph Boston. And then … wonder of wonders … I saw Herr Adolph Hitler, salute this lad. I looked on with a heart which beat proudly as the lad who was crowned king of the 100 meters event, get an ovation the like of which I have never heard before. 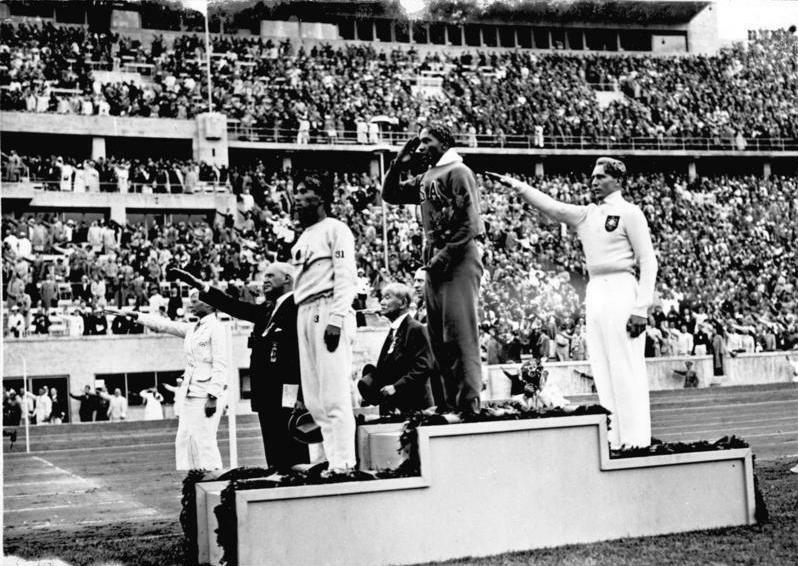 I saw Jesse Owens greeted by the Grand Chancellor of this country as a brilliant sun peeped out through the clouds. I saw a vast crowd of some 85,000 or 90,000 people stand up and cheer him to the echo. However, in 2014, Eric Brown, British fighter pilot and test pilot, the Fleet Air Arm’s most decorated living pilot, independently stated in a BBC documentary: “I actually witnessed Hitler shaking hands with Jesse Owens and congratulating him on what he had achieved.” Additionally, an article in The Baltimore Sun in August 1936 reported that Hitler sent Owens a commemorative inscribed cabinet photograph of himself. Meanwhile . . . on October 15th, 1936, Owens repeated this allegation when he addressed an audience of African Americans at a Republican rally in Kansas City, remarking: “Hitler didn’t snub me — it was our president who snubbed me. The president didn’t even send me a telegram.” A real instance of the pot calling the kettle – er – Black. The US was just as replete with racism as Nazi Germany, and the Holocaust originated in eugenics carried out by scientists in California who instructed the Nazis in the 1930s. Joseph Mengele was taught by Americans!!!! Furthermore, the US refused to get involved in the Second World War until the Japanese bombed Pearl Harbor. To be fair, Britain, France, and Russia did not want to get involved either until their homelands were threatened. In Germany, Owens had been allowed to travel with and stay in the same hotels as whites, at a time when African Americans in many parts of the United States had to stay in segregated hotels that accommodated only Blacks. When Owens returned to the United States, he was greeted in New York City by Mayor Fiorello LaGuardia. During a Manhattan ticker-tape parade in his honor along Broadway’s Canyon of Heroes, someone handed Owens a paper bag. Owens paid it little mind until the parade concluded. When he opened it up, he found that the bag contained $10,000 in cash. Owens’s wife Ruth later said: “And he [Owens] didn’t know who was good enough to do a thing like that. And with all the excitement around, he didn’t pick it up right away. He didn’t pick it up until he got ready to get out of the car.” After the parade, Owens was not permitted to enter through the main doors of the Waldorf Astoria New York and instead forced to travel up to the event in a freight elevator to reach the reception honoring him. President Franklin D. Roosevelt (FDR) never invited Jesse Owens to the White House following his triumphs at the Olympic Games. When the Democrats bid for his support, Owens rejected those overtures: as a staunch Republican, he endorsed Alf Landon, Roosevelt’s Republican opponent in the 1936 presidential race. After the games had ended, the entire Olympic team was invited to compete in Sweden. Owens decided to capitalize on his success by returning to the United States to take up some of the more lucrative endorsement offers. United States athletic officials were furious and withdrew his amateur status, which immediately ended his career. Owens was angry, saying, “A fellow desires something for himself.” Owens argued that the racial discrimination he had faced throughout his athletic career, such as not being eligible for scholarships in college and therefore being unable to take classes between training and working to pay his way, meant he had to give up on amateur athletics in pursuit of financial gain elsewhere. 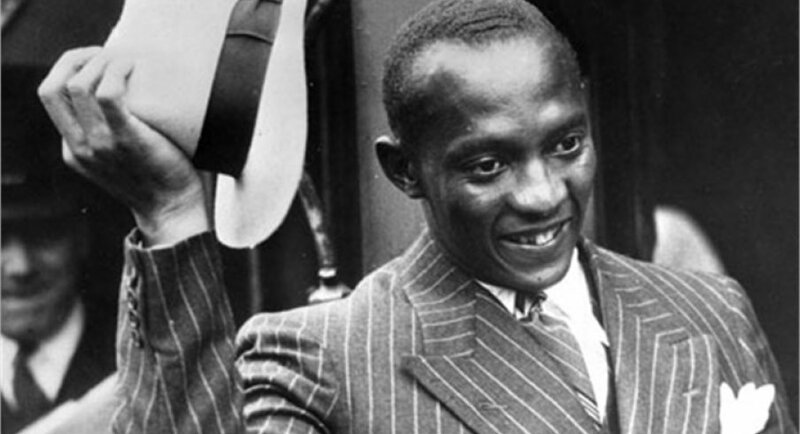 Jesse Owens returned home from the 1936 Olympics with four gold medals and international fame, but there were no guarantees for his future prosperity. Racism was still prevalent in the United States, and he had difficulty finding work. He took on menial jobs as a gas station attendant, playground janitor, and manager of a dry cleaning firm. He also raced against amateurs and horses for cash. Owens was prohibited from making appearances at amateur sporting events to bolster his profile, and he found out that the commercial offers had all but disappeared. In 1937, he briefly toured with a twelve-piece jazz band under contract with Consolidated Artists but found it unfulfilling. He also made appearances at baseball games and other events. Finally, Willis Ward—a friend and former competitor from the University of Michigan— brought Owens to Detroit in 1942 to work at Ford Motor Company as Assistant Personnel Director. He later became a director, where he worked until 1946. Owens ran a dry cleaning business and worked as a gas station attendant to earn a living, but he eventually filed for bankruptcy. In 1966, he was successfully prosecuted for tax evasion. At rock bottom, he was aided in beginning his rehabilitation. The government appointed him as a US goodwill ambassador. Owens traveled the world and spoke to companies such as the Ford Motor Company and stakeholders such as the United States Olympic Committee. By this time, Civil Rights had made a mark. One of the great old timey recipes from Alabama is bananas and custard, which is as easy to make as it sounds. It is not to be confused with banana cream pie, or banana custard pie. 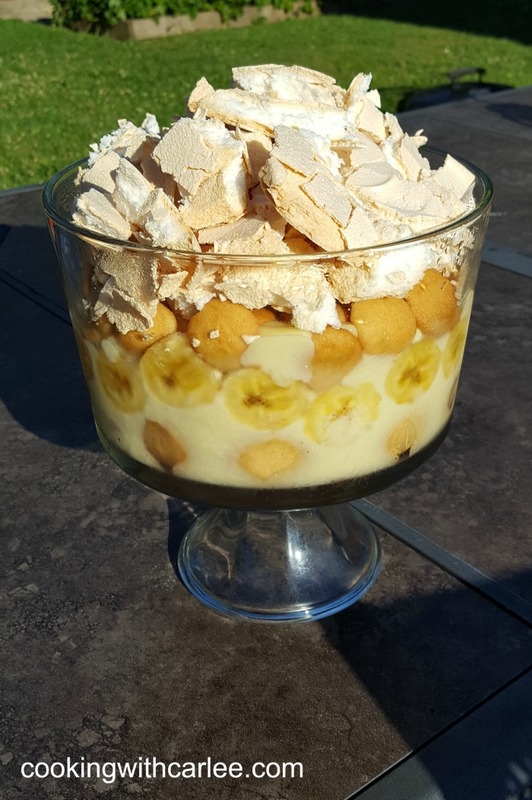 You’ll need bananas, vanilla biscuits (cookies), egg custard, and toasted meringues. Make an egg custard of your choice. I make a classic egg custard in a double boiler, which is not complicated – egg yolks, cream, and sugar. Use the whites to make meringues. Assemble by cutting bananas into a bowl and adding an equal quantity of vanilla biscuits or wafers. Pour custard over the bananas and biscuits to cover, and chill. When ready to serve, top with meringues. Today is Sámi National Day, an ethnic national day for the Sámi people that falls on February 6th because this date was when the first Sámi congress was held in 1917 in Trondheim. This congress was the first time that Norwegian and Swedish Sámi came together across their national borders to work together to find solutions for common problems. In 1992, at the 15th Sámi Conference in Helsinki, a resolution was passed that Sámi National Day should be celebrated on February 6th. Sámi National Day is a celebration for all Sámi, regardless of where they live, and on that day the Sámi flag should be flown and the Sámi national anthem is sung in the local Sámi dialect. Through pure coincidence, this date also happened to be when representatives of the Sámi of the Kola Peninsula used to gather annually, meeting with Russian bureaucrats to debate and decide on issues of relevance to them. This body, called the Koladak Sobbar, has been called the ‘first Sámi Parliament’ by the researcher Johan Albert Kalstad. This information did not influence the choice of this date as the Sámi People’s Day, given that the people present did not know about it – the Koladak Sobbar existed during the late 19th century only, and was not ‘rediscovered’ by Kalstad until the 21st century. Before I continue talking about the Sámi people in general, I want to point out that this celebration is really a model for indigenous peoples who are ethnic minorities, and who are scattered across national boundaries. The Sámi (often called Lapps in English) represent only about 5% of the population in the region where they live which spreads across northern Norway, Sweden, Finland, and Russia. Long ago, they were the majority in the region, but they were slowly encroached upon by Scandinavians and Russians. The enduring question is how to maintain some degree of autonomy and unity in the face of pressures to assimilate to national cultures, especially when these nations fragment the region where they live – called Sápmi in Sámi (Lapland in English). The term Lapp (and European cognates) is sometimes seen as derogatory because it is an outsider term. It has no pejorative connotations that I know of, but it is best not to use it. Apparently, the Sámi object less to Lapland than to Lapp. 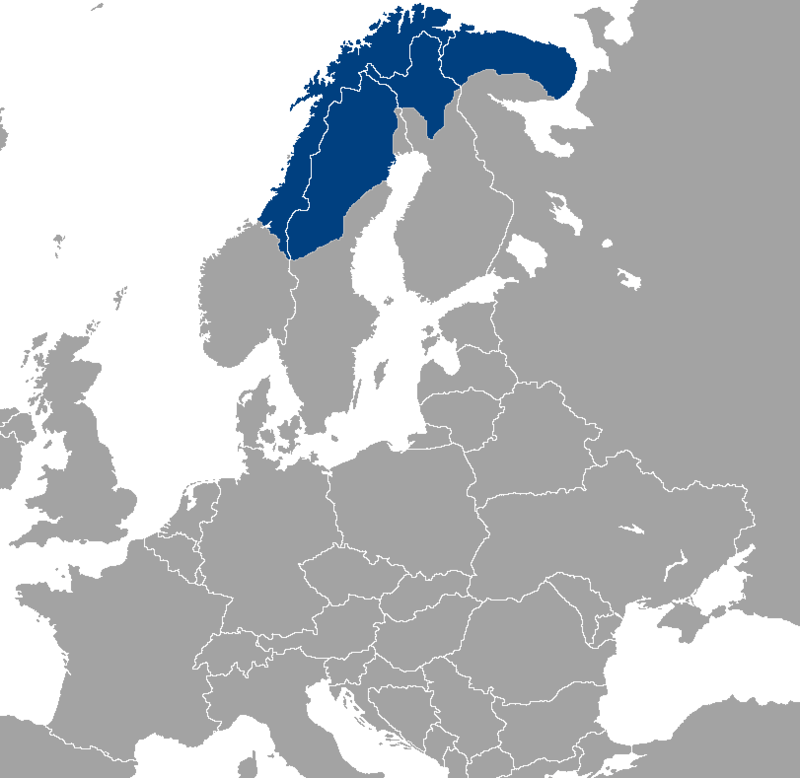 If we look at language first we can get a sense of the geography and distribution of the Sámi. The Saamic languages are the region’s main minority languages and also, of course, its original languages. They belong to the Uralic language family, and are most closely related to the Finnic languages. 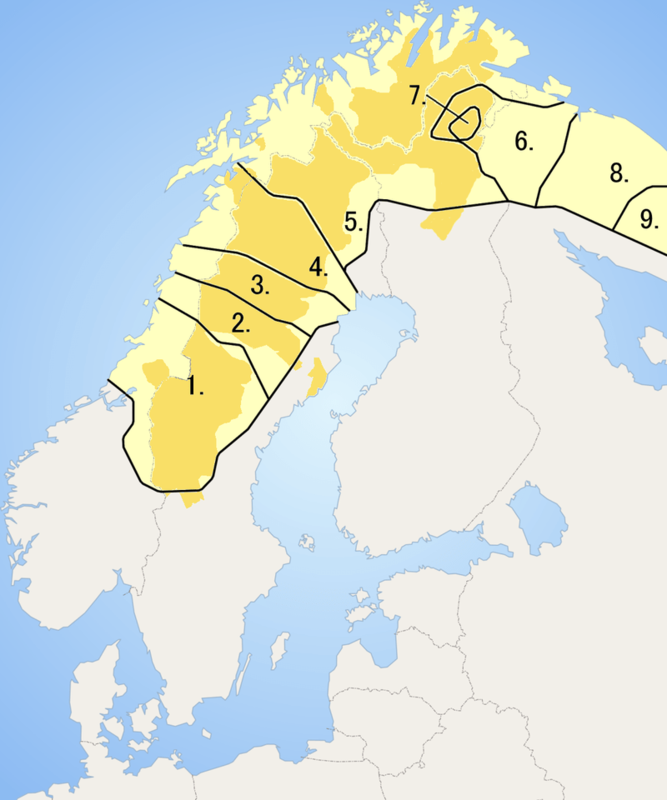 Many Sámi languages are mutually unintelligible, but the languages originally formed a dialect continuum stretching southwest-northeast, so that a message could hypothetically be passed between Sámi speakers from one end to the other and be understood by all. Today, however, many of the languages are all but extinct, and thus there are “gaps” in the original continuum. On the map above numbers indicate Sámi Languages (Darkened areas represent municipalities that recognize Sámi as an official language. ): 1. South (Åarjil) Sámi, 2. Ume (Upme) Sámi, 3. Pite (Bitthun) Sámi, 4. Lule (Julev) Sámi, 5. North (Davvi) Sámi, 6. Skolt Sámi, 7. Inari (Ánár) Sámi, 8. Kildin Sámi, 9. Ter Sámi. Of these languages the Northern one is by far the most vital, whereas Ume, Pite and Ter seem to be dying languages. Kemi Sámi is extinct. Since prehistoric times, the Sámi people of Arctic Europe have lived and worked in an area that stretches over the northern parts of the regions now known as Norway, Sweden, Finland, and the Russian Kola Peninsula. They have inhabited the northern arctic and sub-arctic regions of Fenno-Scandinavia and Russia for at least 5,000 years. The Sámi are counted among the Arctic peoples and are members of circumpolar groups such as the Arctic Council Indigenous Peoples’ Secretariat. Petroglyphs and archeological findings such as settlements dating from about 10,000 BCE can be found in the traditional lands of the Sámi. These hunters and gatherers of the late Paleolithic and early Mesolithic were named Komsa by the researchers because what they called themselves is unknown. Recent archaeological discoveries in Finnish Lapland were originally seen as the continental version of the Komsa culture about the same age as the earliest finds on the coast of Norway. It is hypothesized that the Komsa followed receding glaciers inland from the Arctic coast at the end of the last ice age (between 11000 and 8000 BCE) as new land opened up for settlement (e.g., modern Finnmark area in the northeast of Norway, to the coast of the Kola Peninsula). 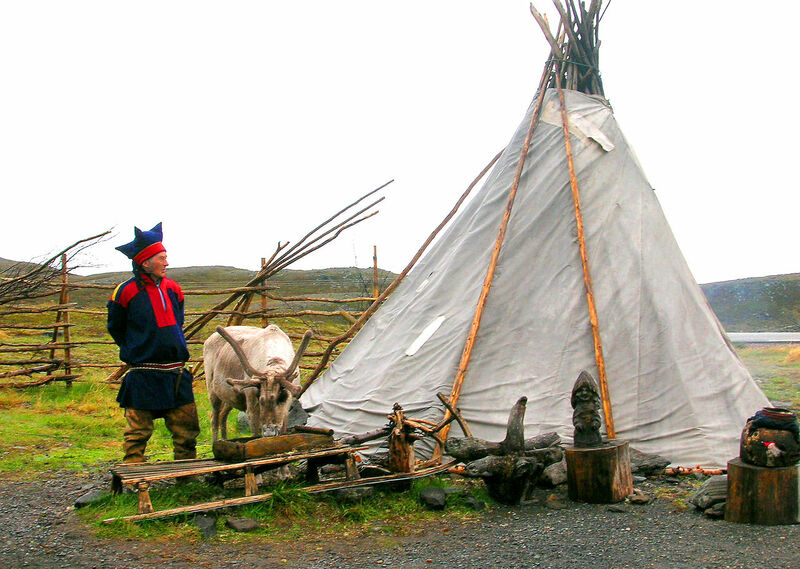 For long periods of time, the Sámi lifestyle thrived because of its adaptation to the Arctic environment. 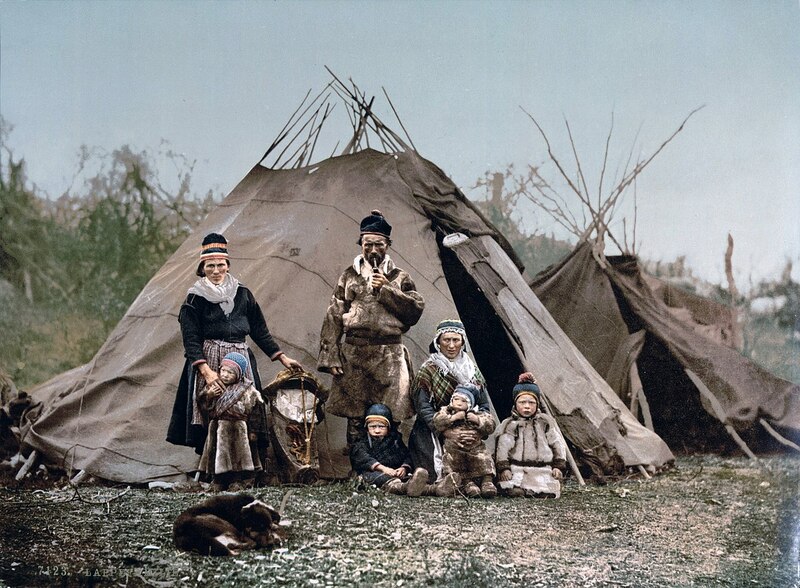 Throughout the 18th century, as Norwegians of Northern Norway suffered from low fish prices and consequent depopulation, the Sámi cultural element was strengthened, since the Sámi were mostly independent of supplies from Southern Norway. During the 19th century, Norwegian authorities pressured the Sámi to adopt Norwegian language and culture universal. Strong economic development of the north also ensued, giving Norwegian culture and language higher status. On the Swedish and Finnish sides, the authorities were less militant, although the Sámi language was forbidden in schools and strong economic development in the north led to weakened cultural and economic status for the Sámi. 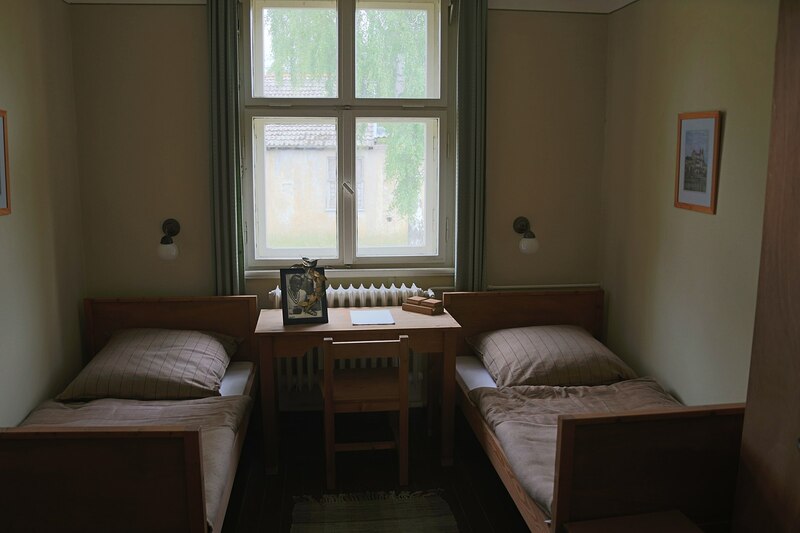 From 1913 to 1920, the Swedish race-segregation political movement created a race-based biological institute that collected research material from living people and graves, and sterilized Sámi women. Throughout history, Swedish settlers were encouraged to move to the northern regions through incentives such as land and water rights, tax allowances, and military exemptions. The strongest pressure took place from around 1900 to 1940, when Norway invested considerable money and effort to wipe out Sámi culture. Anyone who wanted to buy or lease state lands for agriculture in Finnmark had to prove knowledge of the Norwegian language and had to register with a Norwegian name. This caused the dislocation of Sámi people in the 1920s, which increased the gap between local Sámi groups (something still present today) that sometimes has the character of an internal Sámi ethnic conflict. In 1913, the Norwegian parliament passed a bill on “native act land” to allocate the best and most useful lands to Norwegian settlers. Another factor was the scorched earth policy conducted by the German army, resulting in heavy war destruction in northern Finland and northern Norway in 1944–45, destroying all existing houses, or kota, and visible traces of Sámi culture. 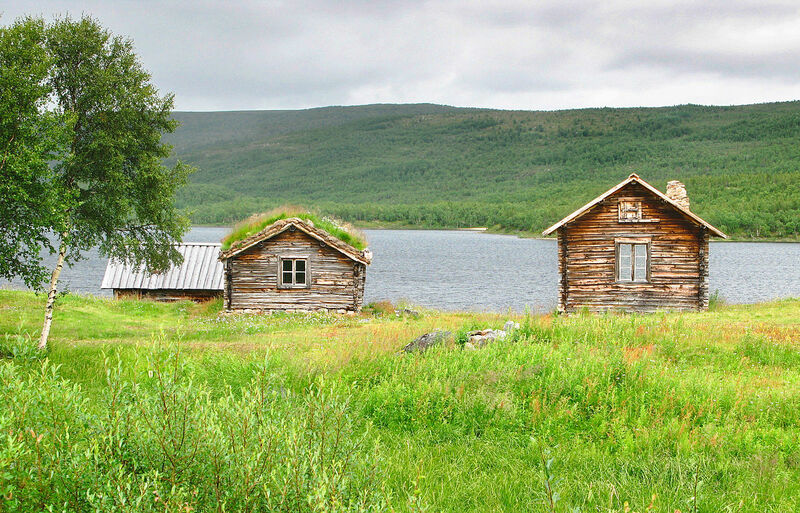 After World War II the pressure was relaxed though the legacy was evident into recent times, such as the 1970s law limiting the size of any house Sámi people were allowed to build. The controversy over the construction of the hydro-electric power station in Alta in 1979 brought Sámi rights to the political agenda. In August 1986, the national anthem (“Sámi soga lávlla”) and flag (Sámi flag) of the Sámi people were created. In 1989, the first Sámi parliament in Norway was elected. In 2005, the Finnmark Act was passed in the Norwegian parliament giving the Sámi parliament and the Finnmark Provincial council a joint responsibility of administering the land areas previously considered state property. These areas (96% of the provincial area), which have always been used primarily by the Sámi, now belong officially to the people of the province, whether Sámi or Norwegian, and not to the Norwegian state. 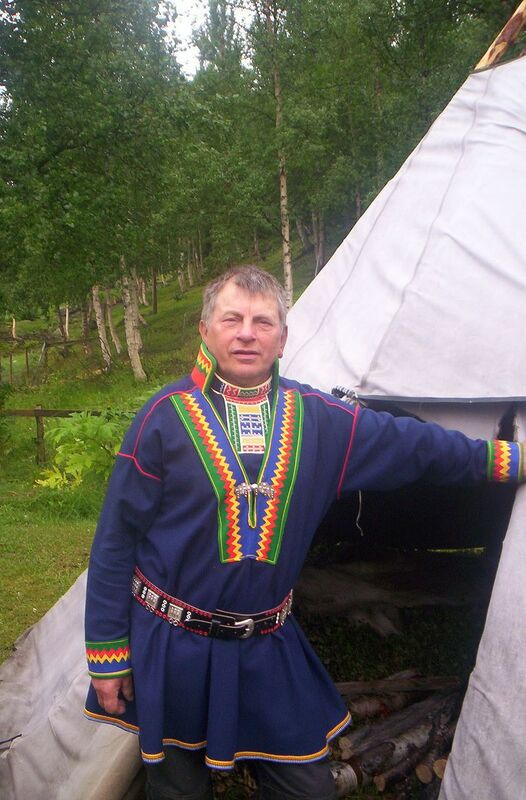 The indigenous Sámi population are mostly urbanized, but a substantial number live in villages in the high arctic. The Sámi are still coping with the cultural consequences of language and culture loss related to generations of Sámi children taken to missionary and/or state-run boarding schools and the legacy of laws that were created to deny the Sámi rights (e.g., freedom of beliefs, use of indigenous language, land ownership, and freedom to practice traditional livelihoods). The Sámi are experiencing cultural and environmental threats, including oil exploration, mining, dam building, logging, climate change, military bombing ranges, tourism, and commercial development. 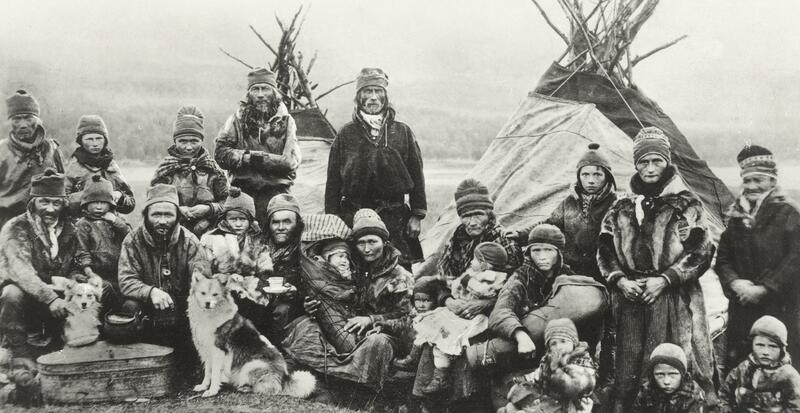 The Sámi have for centuries been the subject of discrimination and abuse by the dominant cultures claiming possession of their lands down to the present day. They have never been a single community in a single region of Lapland, with political autonomy. Norway has been greatly criticized by the international community for the politics of assimilation of and discrimination against the aboriginal peoples of the country. On 8 April 2011, the UN Racial Discrimination Committee recommendations were handed over to Norway. These addressed many issues, including the educational situation for students needing bilingual education in Sámi. One committee recommendation was that no language be allowed to be a basis for discrimination in the Norwegian anti-discrimination laws, and it recommended wording of Racial Discrimination Convention Article 1 contained in the Act. Further points of recommendation concerning the Sámi population in Norway included the incorporation of the racial Convention through the Human Rights Act, improving the availability and quality of interpreter services, and equality of the civil Ombudsman’s recommendations for action. A new present status report was to have been ready by the end of 2012. Even in Finland, where Sámi children, like all Finnish children, are entitled to day care and language instruction in their own language, the Finnish government has denied funding for these rights in most of the country, including even in Rovaniemi, the largest municipality in Finnish Lapland. Sámi activists have pushed for nationwide application of these basic rights. As in the other countries claiming sovereignty over Sámi lands, Sámi activists’ efforts in Finland in the 20th century achieved limited government recognition of Sámi rights as an ethnic minority, but the Finnish government has clung unyieldingly to its legally enforced premise that the Sámi must “prove” their land ownership, an idea incompatible with and antithetical to the traditional reindeer-herding Sámi way of life. This has effectively allowed the Finnish government to take land occupied by the Sámi for centuries without compensation. On Sámi National Day, not only do Sámi throughout Sápmi raise the national flag and sing the national song, they also do a range of activities traditionally associated with Sámi culture, such as wear traditional dress, make traditional dishes and play or listen to traditional music. A characteristic feature of Sámi musical tradition is the singing of yoik (also spelled joik). Yoiks are song-chants and are traditionally sung a cappella, usually sung slowly and deep in the throat with apparent emotional content of sorrow or anger. Yoiks can be dedicated to animals and birds in nature, special people or special occasions, and they can be joyous, sad, or melancholic. They often are based on syllablic improvisation. In recent years, musical instruments frequently accompany yoiks. The only traditional Sámi instruments that were sometimes used to accompany yoik are the “fadno” flute (made from reed-like Angelica archangelica stems) and hand drums (frame drums and bowl drums). Traditional foods of the Sámi involve reindeer, fish, and flatbread. Reindeer is absolutely the most characteristic ingredient, because the Sámi for centuries were reindeer herders. 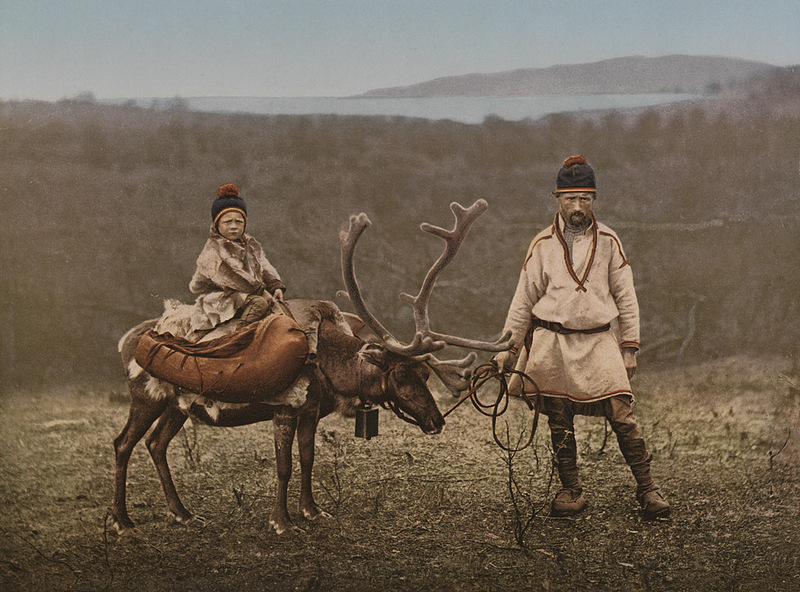 Traditionally, the reindeer were not fully domesticated, but the Sámi were nomadic, following the herds on their seasonal migrations. You might have trouble getting hold of some reindeer to roast, but you might be able to make flatbread. Gáhkko is a traditional Sámi flatbread that has a faint taste of anise. 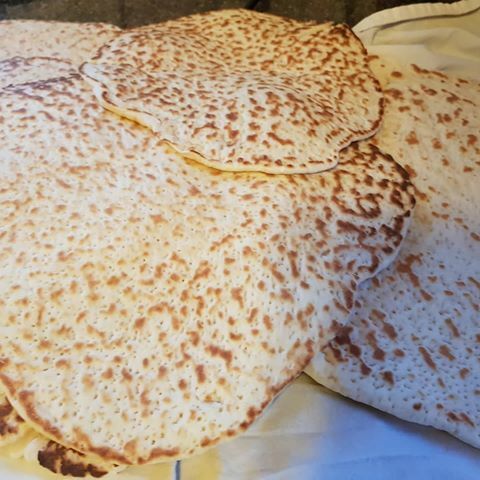 It uses yeast, so it is puffier than other flatbreads, and it is also more complex than most. The most traditional method of cooking is in a dry, cast-iron skillet over an open fire, but a stovetop works as well. This is but one recipe. There are countless styles. You can use a number of sugar syrups in place of Golden Syrup, but do not use corn syrup. If you wish, you can cut fewer breads than described here and make them larger. Place the melted butter in a saucepan over low heat. Add the anise and syrup and stir well until the syrup has been thoroughly incorporated with the butter. Mix in the milk and heat until lukewarm. Remove from the heat. Crumble the yeast into milk mixture and stir well until it has dissolved. Pour into a large mixing bowl. Add the flour and salt to the liquid. Add the flour slowly and mix only until you have a smooth dough. Do not add too much flour. It can be slightly sticky. Turn out on to a flat surface, lightly floured if need be, and knead for about 20 minutes. Place the dough in a lightly oiled bowl and let it rise in a warm place for about 1 hour. Turn the dough on to a flat surface again and knead it again. Then roll the dough into a long sausage, and cut it into about 40 small pieces. Roll the pieces into small balls with your hands and let them rest for about 5 minutes. Press the balls flat and pat them between your palms until you have round breads about ¼ inch thick. Let them for about 30 minutes. Bake the breads in batches in a dry frying pan on a campfire or on the stovetop for about 5-6 minutes on each side. They are cooked when they are golden-brown on both sides. Let the gáhkko cool, but eat immediately. They can be eaten with soups or stews, or with sliced cheese. 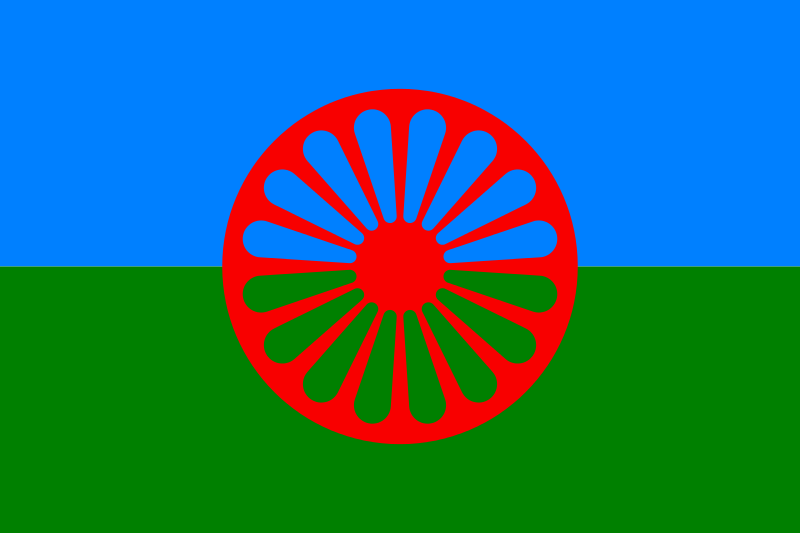 Today is the International Day of the Roma, a large stateless ethnic group known variously as Rom, Romany, Romani etc. and commonly referred to in English as “gypsies,” although that term is now a catchall for a slew of travelling people. The day is meant as a time to celebrate the Romany people’s heritage and accomplishments, as well as a special moment to press for the end of discrimination against them around the world. I have a particular interest in these people because my maternal great-grandfather was Romany (our family term), so, although the connexion is distant, I feel an affinity. Here is a newspaper photo of my great-grandfather, William George Sloper, with his wife and children (my great aunts and uncles). 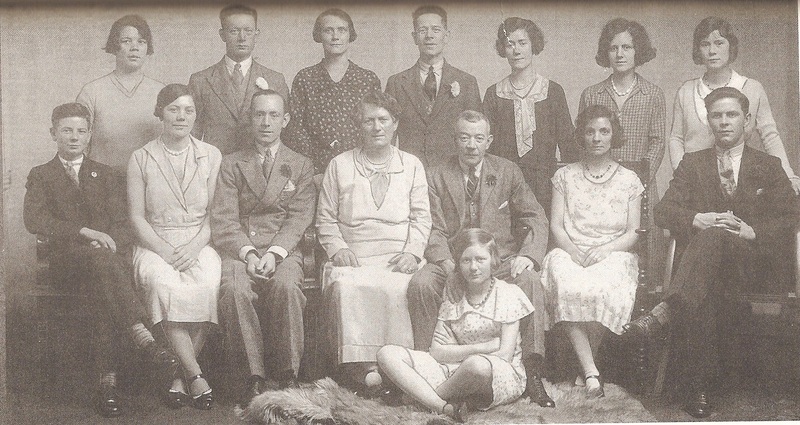 My granddad, Billy Sloper, is seated beside his mother. He was the eldest of this large brood – not uncommon for Romany then and now. I never knew my great-grandfather, of course, but I knew quite a few of his children. He was a circus trapeze artist in his youth, but when the troupe was performing in Oxford he met my great-grandmother (not Romany) married and settled down in a house in a district know as St Ebbes (colloquially, The Friars), and worked as a gas fitter (a specialized form of plumbing). When I was at Oxford (early 1970’s) I was able to meet and get to know the surviving siblings. It is a daunting task to try to say something in a short space about the Romany as a whole; they are so diverse and scattered. Even the basic language has seven distinct branches that are mutually unintelligible. There are some core values that are more or less universal to all Romany groups, but over time these have become diluted, and, typically, relatively settled groups take on the characteristics of the culture where they live. Thus, for example, Romany may be Roman Catholic, Eastern Orthodox, or Muslim, with a few Protestants mixed in depending on their location. To make life a bit easier I am going to give a brief overview and in the process I’ll also say something about the centuries of discrimination. The Romany are a diasporic (territorially scattered) ethnicity of Indian origin, living mostly in Europe and the Americas. In their own language, generally called “Romani” by scholars, they are known collectively as Romane or Rromane (depending on the dialect). The double “r” in the latter is guttural and trilled. Romany are widely dispersed, with their largest concentrated populations in Europe — especially central and eastern Europe and Anatolia, the Iberian Kale, and Southern France. They originated in India and arrived in midwest Asia, then Europe, at least 1000 years ago, either separating from the Dom people or, at least, having a similar history; the ancestors of both the Romani and the Dom left North India some time between the sixth and eleventh century. There is very little linguistic or historical evidence to pin down the time of migration from India more precisely. It is conjectured that they were low caste musicians and entertainers who traveled to make a living. Since the nineteenth century, some Romany have migrated to the Americas. There are an estimated one million in the United States; and more than 600,000 in Brazil, most of whose ancestors emigrated in the 19th century from eastern Europe. Brazil also includes Romany descended from people deported by the government of Portugal during the Inquisition in the colonial era. In migrations since the late 19th century, Romany have also moved to Canada and countries in South America. Argentina has a population of more than 300,000 Romany most of whom are still migratory. Many make a living trading in used cars as they once used to with horses. One of my early nicknames in Buenos Aires was “Gitano,” not because of my heritage but because I travel a lot. The Romany are probably unique among diasporic peoples in that they have never identified themselves with a territory, have no tradition of an ancient and distant homeland from which their ancestors migrated, and do not claim the right to national sovereignty in any of the lands where they reside. Rather, Romany identity is bound up with the ideal of freedom expressed, in part, in having no ties to a homeland or, in many instances in a home locale. Traditionally they are travelers. The absence of neither orally transmitted origin stories nor of a written history has meant that the origin and early history of the Romany people was long an enigma. Indian origin was suggested on linguistic grounds as early as 200 years ago. 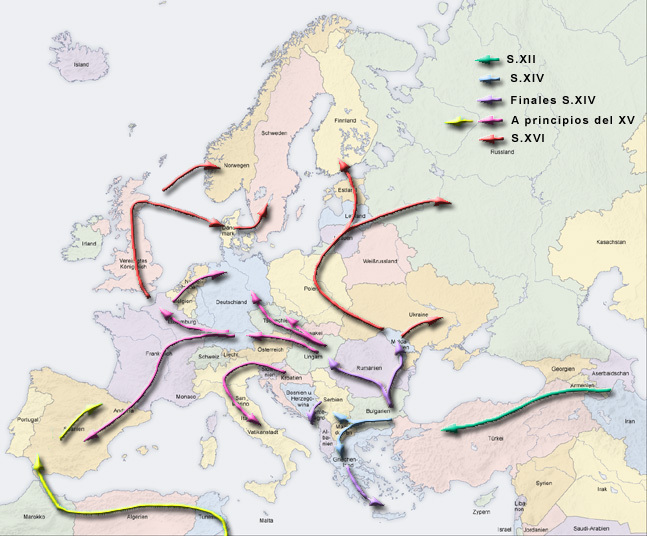 Now genetic evidence connects the Romany people and the Jat people, the descendants of groups which emigrated from South Asia towards Central Asia during the medieval period. Recent analysis of Y-chromosomes (paternally inherited) and mitochondrial DNA (maternally inherited) shows that a large percentage of contemporary Romany carry genetic material that is not found elsewhere outside of India. Contemporary scholars have suggested that one of the first written references to the Romany, under the term “Atsingani” (that is, from the Greek atsinganoi, cognate with “tzigani” or “gitani,” Romance words for “gypsies”), dates from the Byzantine era during a time of famine in the 9th century. In the year 800 CE, Saint Athanasia gave food to “foreigners called the Atsingani” near Thrace. Later, in 803 CE, Theophanes the Confessor wrote that Emperor Nikephoros I had the help of the “Atsingani” to put down a riot with their “knowledge of magic.” However, the Atsingani were also a Manichean sect that disappeared from chronicles in the 11th century. “Atsinganoi” was used to refer to itinerant fortune tellers, ventriloquists and wizards who visited the Emperor Constantine IX in the year 1054. The map below (click to enlarge) gives a good representation of the migrations of Romany from the 12th to 16th although it contains a fair degree of speculation and interpolation. Early histories show a mixed reception for Romany in Europe. Although 1385 marks the first recorded transaction for a Romany slave in Wallachia, they were issued safe conduct by Sigismund of the Holy Roman Empire in 1417. Romany were ordered expelled from the Meissen region of Germany in 1416, Lucerne in 1471, Milan in 1493, France in 1504, Catalonia in 1512, Sweden in 1525, England in 1530, and Denmark in 1536. In 1510, any Romany found in Switzerland were ordered to be put to death, with similar rules established in England in 1554, and Denmark in 1589. Portugal began deportations of Romanies to its colonies in 1538. Later, a 1596 English statute, however, gave Romanies special privileges that other itinerants lacked and France passed a similar law in 1683. Catherine the Great of Russia declared the Romany “crown slaves” (a status superior to serfs), but also kept them out of certain parts of the capital. In 1595, Ştefan Răzvan overcame the stigma of his birth to a Romany father, and became the voivode (prince) of Moldavia. He was a rare exception, however. In sum, from the 16th to 19th centuries European Romany were alternately left alone, persecuted, enslaved, exiled, disenfranchised, executed en masse, and forcibly assimilated. Without power, wealth, or influence they were at the mercy of political forces and were often made the scapegoats for social troubles that were none of their making. On the other side of the coin, in the late 19th century Romany were frequently admired in the arts. So-called gypsy music became immensely popular in this period. Strictly speaking there is no unified style of Romany music. Romany musicians in various countries took the local musical forms and made them their own. 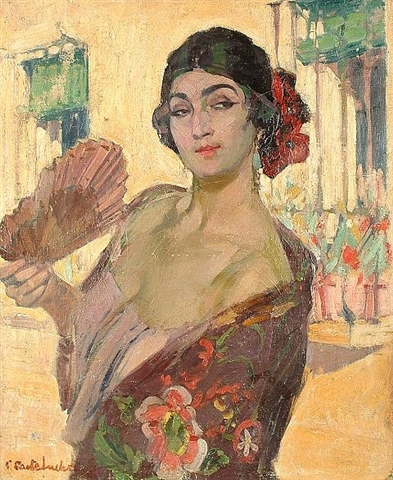 Famous examples include the Andalusian flamenco which has frequently been performed and influenced by Romany musicians, and the Hungarian csárdás, composed examples of which found their way into the classical repertoire. Classical composers who have used csárdás themes in their works include Emmerich Kálmán, Franz Liszt, Johannes Brahms, Léo Delibes, Johann Strauss, Pablo de Sarasate, Pyotr Ilyich Tchaikovsky and others. The csárdás from Strauss’s operetta Die Fledermaus, sung by the character Rosalinde, is probably the most famous example of this style in vocal music. One of the best-known instrumental csárdás is the composition by Vittorio Monti written for violin and piano, but here played by a Hungarian Romany orchestra. Of course Bizet’s Carmen romanticizes the mystery and passion of the Romany. (A modern analog would be Cher’s “Gypsies, Tramps, and Thieves”). The fate of the Romany has been equally mixed, as in previous eras, in the 20th and 21st centuries. During World War II, the Nazis murdered hundreds of thousands of Romany in what is sometimes referred to as the “other Holocaust.” Numbers killed are impossible to determine accurately and figures range from a low of 220,000 to as many as 1.5 million. Like the Jews, they were sentenced to forced labor and imprisonment in concentration camps. They were often killed on sight, especially by the Einsatzgruppen on the Eastern Front. In Communist central and eastern Europe, Romanies experienced assimilation schemes and restrictions of cultural freedom. The Romani language and Romany music were banned from public performance in Bulgaria. In Czechoslovakia, tens of thousands of Romany from Slovakia, Hungary and Romania were re-settled in border areas of Czech lands and their nomadic lifestyle was forbidden. In Czechoslovakia, where they were labeled as a “socially degraded stratum,” Romany women were sterilized as part of a state policy to reduce their population. This policy was implemented with large financial incentives, threats of denying future social welfare payments, misinformation, and involuntary sterilization. In the early 1990s, Germany deported tens of thousands of migrants to central and eastern Europe. Sixty percent of around 100,000 Romanian nationals deported under a 1992 treaty were Romany. During the 1990s and early 21st century many Romany from central and eastern Europe attempted to migrate to western Europe or Canada. The majority of them were turned back. Several of these countries established strict visa requirements to prevent further migration. In 2005, the Decade of Roma Inclusion was launched in nine central and southeastern European countries to improve the socio-economic status and social inclusion of the Romany minority across the region. The first World Romani Congress was organized in 1971 near London, funded in part by the World Council of Churches and the Government of India. It was attended by representatives from India and 20 other countries. At the congress, the green and blue flag from a 1933 conference, embellished with the red, sixteen-spoked chakra, was reaffirmed as the national emblem of the Romani people, and the anthem “Gelem, Gelem” was adopted as a national anthem. The International Romani Union was officially established in 1977, and in 1990, the fourth World Congress declared April 8 to be International Day of the Roma, a day to celebrate Romani culture and raise awareness of the issues facing the Romani community. The 5th World Romany Congress in 2000 issued an official declaration of the Romany as a non-territorial nation. There have been many studies of Romany culture but you have to take them with a grain of salt. I don’t think you can speak of a unified underpinning that unites all Romany peoples, although worldwide there is a definite sense among Romany peoples that you are either embracing the Romany ethos or you are not. Anthropologists would define them as patriarchal and patrilocal. Women generally hold a lower position than men although they can achieve a measure of social status as they get older and as they have children. They have tended to have large families, and a high value is placed, therefore, on childbirth. Very Biblical. A woman on marriage moves to live with her husband’s family and her duties shift from her parents to her in-laws. Romany traditional purity laws are similar to those of both Hindus and Jews. Certain body parts, animals, acts etc. are considered impure, and any violation of purity laws must be atoned for. In classic Romany culture failure to abide by such rules, called “Romanipen,” can lead to exclusion from the community. Someone who fails to adhere to Romanipen is known as a Gadjo. But as with Jewish and Hindu rules of this sort, in the modern world many Romany no longer follow Romanipen completely, although a substantial percentage in eastern Europe living in Romany enclaves do. I could not leave this discussion of the Romany without a tip of the hat to the vardo, or gypsy wagon, a unique feature of English Romany. They were a very common sight on roads in England in the 19th and early 20th century. 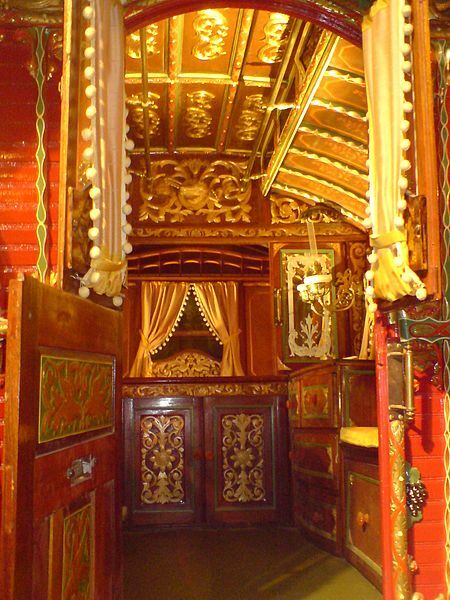 They are highly decorated horse drawn wagons that are both home and transport. 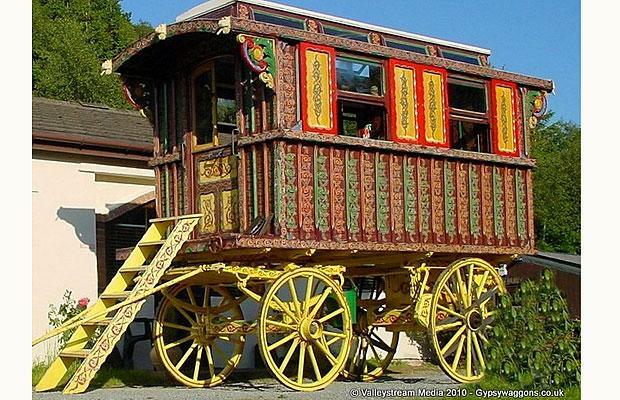 Nowadays about 1% of English Romany live and travel in them although they are not normally as highly decorated as they once were. They are now mostly collectors’ items and there are several projects at the moment to restore abandoned vardos. Here’s a few images to whet your appetite. Speaking of appetite, there is not much I can say about Romany food. When asked about what they eat Romany will normally reply “we eat what you eat.” This is generally the case but I can note a few points. First is the traditional method of cooking – a cast iron pot slung over an open fire. In Our Forgotten Years: A Gypsy Woman’s Life on the Road, Maggie Smith-Bendell talks about the open fire, called in Angloromani (the English Romany creole dialect), a yog: “The yog was the ­centre of our life, of our family. Everything got discussed and pulled apart and put back together in front of the yog. It was everybody’s job to keep it ­going. I still have fires outside.” It was also common to eat from a single communal dish, using the right hand only, as is customary throughout India. Smith-Bendell also notes that it was normal to catch and eat small animals such as rabbits and hedgehogs, although in the latter case they were considered impure in the breeding season. So, I suggest a rabbit stew. No great secret here. Brown off a jointed rabbit with some onions. Add what vegetables you have to hand and top off your cooking pot with water. You can also add field herbs of your choosing. In English byways and woods there are still plenty to be found. 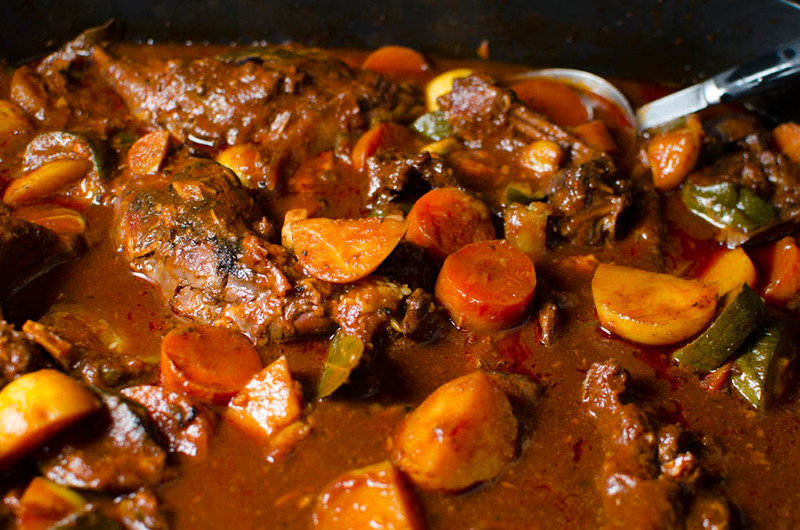 Simmer for an hour or more until the rabbit is tender. With store bought rabbit (sadly lacking in flavor in comparison with wild rabbits) an hour is sufficient.